A call to Fraser Yachts brings more news about James Munn's latest listing, a new-build 52m explorer yacht from Fassmer Werft in Germany. This yacht is an evolution of the immensely successful Hanse Explorer and based on the same engineering platform. At 1100 GT the 52 Explorer has similar volumes to a 60m and is optimised for private or charter use with a separate owner’s deck, five guest staterooms and staff accommodation. Fully ice classed with a single engine and antiroll mechanism without appendages, the 52 Explorer is built on a proven platform using Fassmer’s commercial experience to create a vessel that works and will keep on working wherever she is in the world. Safety and comfort are of primary importance as well as the environmental features that allow her to cruise autonomously in the most sensitive areas of the planet. 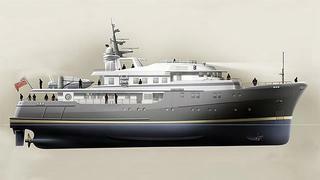 Available in 2015, the 52m explorer yacht is asking €22 million.